I love roasted butternut squash soup. This one stands out because of the other flavors involved: apples, hint of chili, rosemary, coriander, and of course cream. It’s also fairly easy because pretty much everything just roasts together for the same amount of time. I altered this recipe from NPR, (which originally was a Jamie Oliver recipe) just a little bit. They suggested putting the pumpkin seeds in the oven alongside the vegetables for 10-15 minutes, but that resulted in black, smelly pumpkin seeds. Instead, I just toasted them on a skillet for a few minutes, stirring a few times to make sure they got evenly browned. 2/3 cup light cream–I used a combination of half and half and heavy cream, and you can probably get away with less cream if you want to keep it light. Spread the squash, apples, onion, chili and garlic on a baking sheet. Sprinkle with the salt, pepper, coriander and rosemary. Drizzle with 1/4 cup olive oil and toss until well coated. Roast for 45 minutes to 1 hour, or until all the vegetables are cooked through and golden. 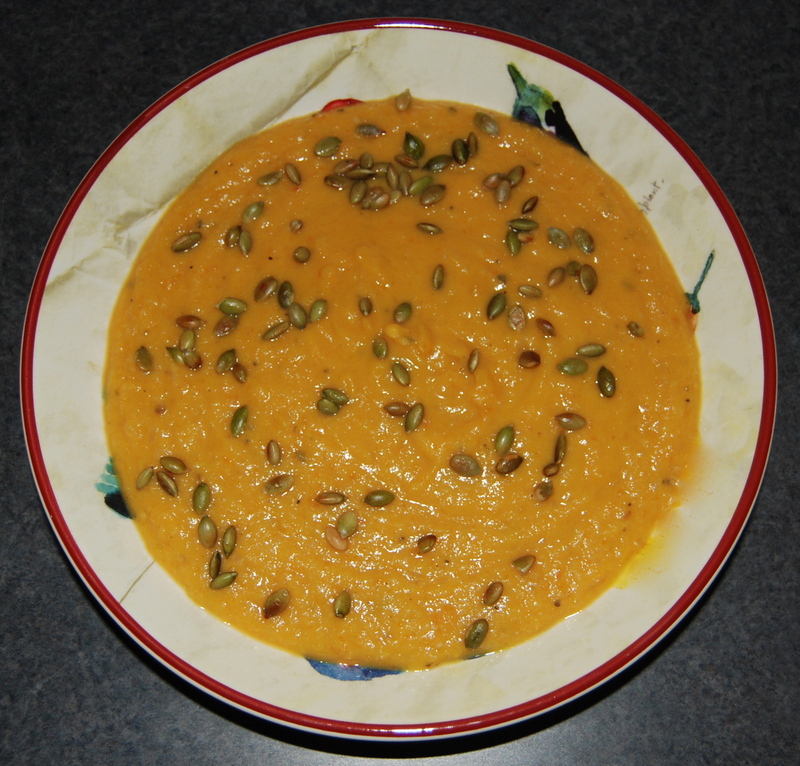 Heat a skillet to medium-low, and toast pumpkin seeds, tossing occasionally, until evenly browned–about 5-10 minutes. Remove the vegetables from the oven. When they are cool enough to handle, squeeze the garlic from the peel. If you have an immersion blender, scrape the vegetables into a large pot. Deglaze the baking sheet with 1/4 cup boiling water, scraping at the burned-on bits to capture them. Add the water to the pot. Add the stock to the pot and puree, using the immersion blender. If you are using a countertop blender, deglaze the pan as above and pour into the blender. Add roughly 1/3 of the vegetables from the baking sheet and puree. Transfer puree to a large pot. Continue this process with the rest of the vegetables, using the stock. Once the vegetables are pureed in the pot, add the cream and bring to a simmer over medium-low heat. Simmer until the soup is warmed through and reaches your preferred consistency. To serve, divide into bowls. Drizzle with pumpkin seed oil (or not). Top with toasted pumpkin seeds. 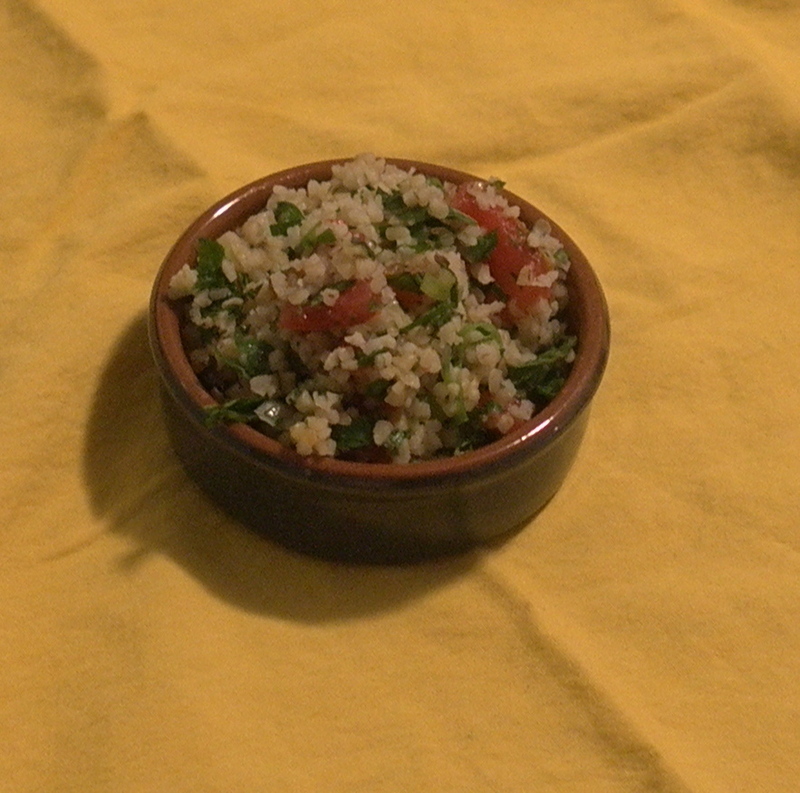 This is a basic tabbouleh recipe that does not require a lot of ingredients. If you are looking for more of a meal, check out my tabbouleh with chicken and tahini recipe here. This week, we got a lot of parsley from the CSA, and tabbouleh is my favorite way to use it all up. Thanks to Simply Recipes for the original recipe. I revised the amounts when I made it myself. Feel free to increase the herbs and decrease the bulgur or the other way around, depending on the ratio you prefer. 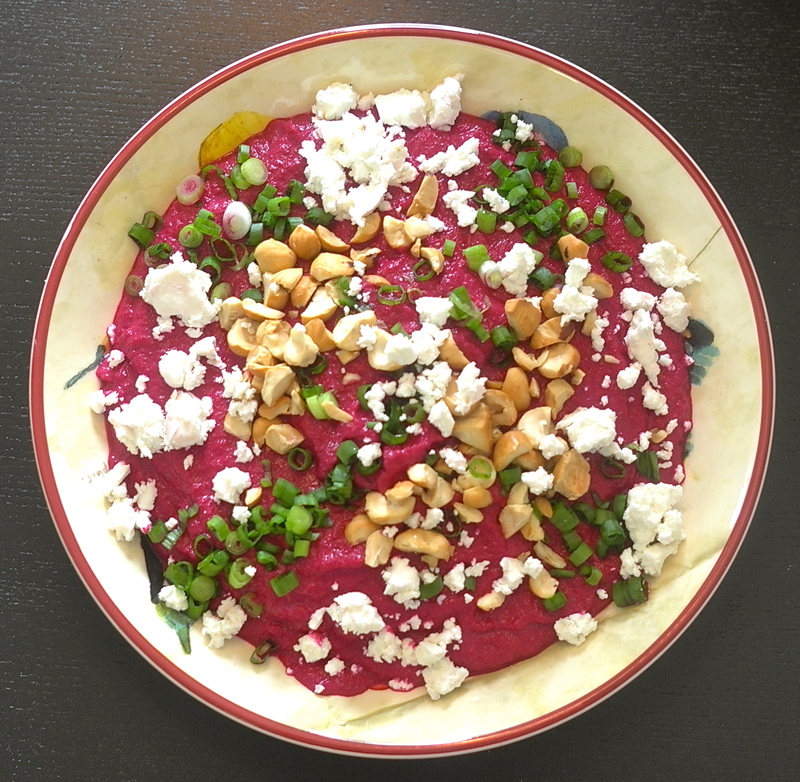 (I like more herbs when eating it with pita, more bulgur when eating it as a stand-alone salad). Do you have another favorite recipe that highlights parsley? Send it along! Place the bulgur in a medium sized bowl. Bring water and the teaspoon of salt to a boil, pour it over the bulgur. Let sit for 30 minutes. In a large bowl, add the olive oil, lemon juice, bulgur and mix well. Add in all the other ingredients and mix to combine. Taste the tabbouleh, and add more salt, olive oil or more lemon juice to taste. Let marinate for at least 30 minutes before serving. Will keep chilled for several days. I was wondering what to do with all my radishes, beyond slicing and sprinkling them over greens. This recipe used up the rest of ours from our share, and the radishes and pickle relish add some great flavor to the potatoes. This is one of several recipes that I made from Food and Wine’s most recent Grilling issue (although there is no grilling involved for this recipe, I’ll be posting the grilled kale recipe soon). I like that it is a make-ahead dish, so it is absolutely no work on the day you serve it. It stays good for two days after you make it. 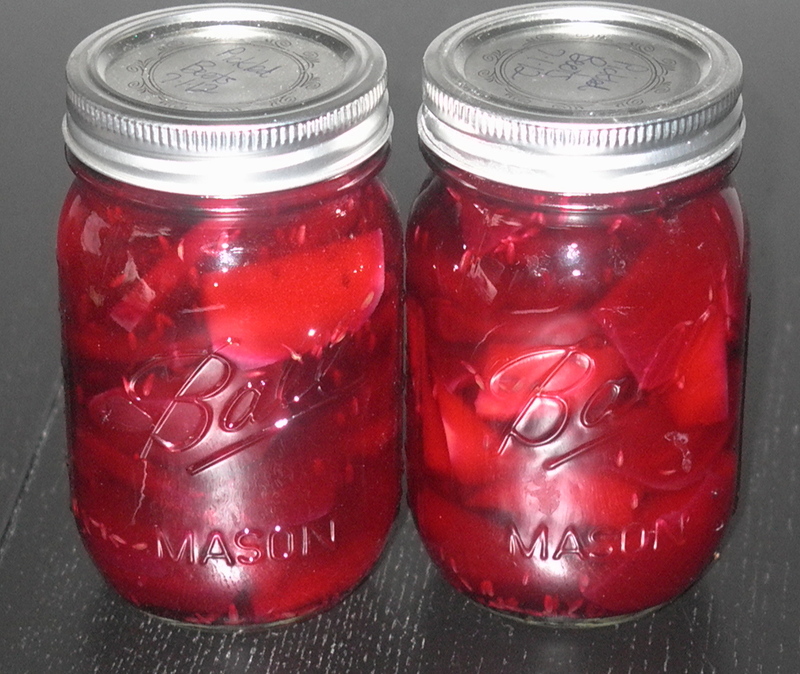 At this point, I have several recipes on this blog that feature the radish. You can just click on “radish” in the right column, and find other recipes that use this vegetable. Have you done anything exciting with your radishes? Let me know…I’d love to know and share more ways to use these, as I think more are arriving from the farm this week! In a large pot, cover the potatoes with water, add a large pinch of salt and bring to a boil. Cook over moderately high heat until tender, about 20 minutes. Drain the potatoes and return them to the pot. Shake the pot over moderately high heat for about 10 seconds to dry the potatoes. Transfer the potatoes to a large rimmed baking sheet and let cool completely. Peel the potatoes and cut into 1-inch pieces. In a large bowl, blend the mayonnaise with the relish, vinegar, mustard powder, paprika, black pepper, cayenne, radishes, celery and onion. Gently fold in the potatoes and season with salt (I did not add any more salt at this point, I would wait until you serve it to decide if more salt is needed). 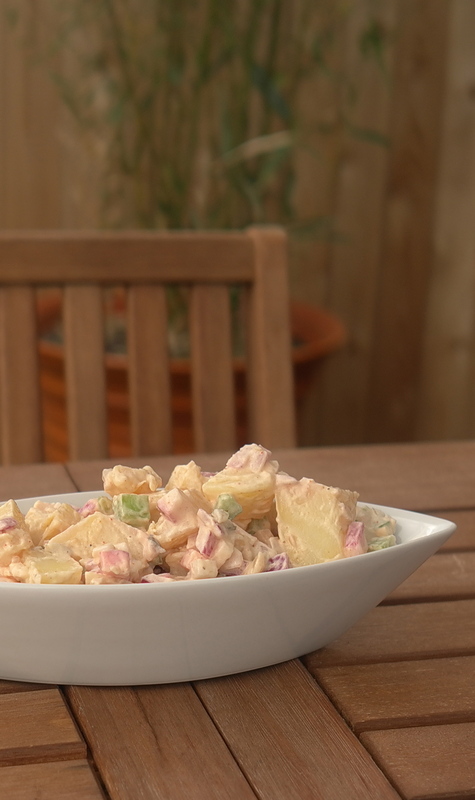 Refrigerate the potato salad for at least 4 hours or overnight. Serve cold or lightly chilled. This sweet and spicy combination is also a combination of two CSAs. (For my original post about the CSA, click here).For the past few years, I’ve been a member of Dumbo/Vinegar Hill’s CSA. I loved so many things about it: Sang Lee’s incredible organic vegetables, the serene location in Phoenix House’s courtyard, and the neighborhood friends I made while volunteering at weekly pick-ups. I also loved the convenience factor; the pick-up location was just a short and cobblestony walk along the river from my apartment. And so, although I felt a little bit like I was cheating on Sang Lee, I went ahead to pick up my first share of the season. The vegetables have been delicious so far. The spicy greens are, in fact, very spicy. This strawberry dressing is an interesting contrast. 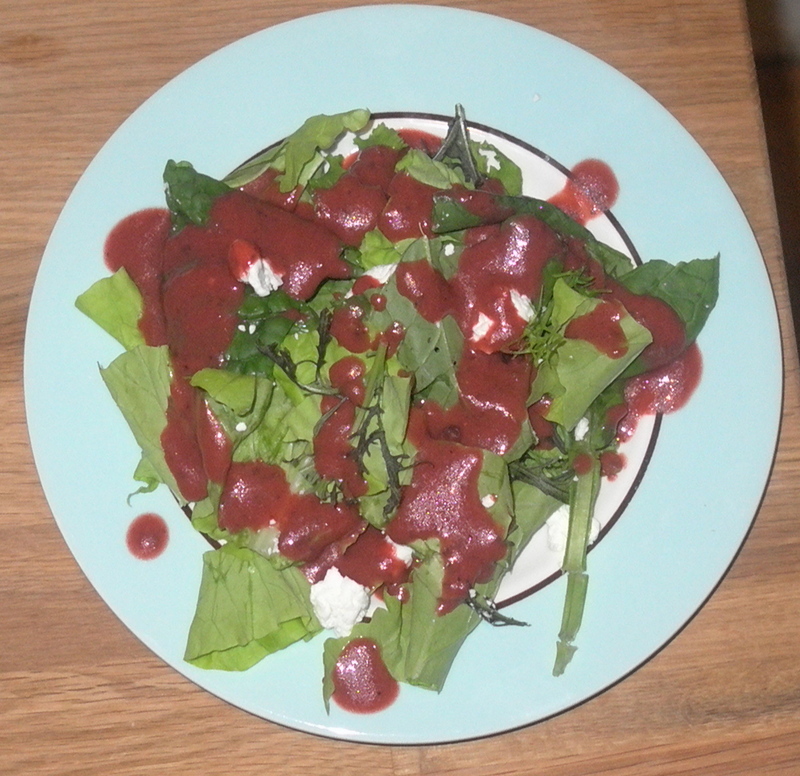 The dressing recipe is from Sang Lee’s recipe blog, so I think of this salad/dressing as a CSA merger. I used the spicy greens mix from the CSA share, and topped it with some goat cheese. I actually halved this dressing recipe and it was plenty for the week. Since I went a little overboard on strawberries from the farmer’s market a few weeks back, I had fun with canning and freezing a few quarts. I just let a cup of the frozen guys thaw for an hour or so before starting the recipe. Dice your strawberries and add the sugar and lemon juice to a small bowl. Muddle them together until somewhat liquid. In a blender, add all other ingredients(imersion blender/food processor work too). Then add the strawberry mixture and blend for a few minutes to immulsify everything and make the strawberries smooth.